OBD II fault code P0420 is a generic code that is defined as “Catalytic Converter System Bank 1, Efficiency below Threshold”, and is set when the PCM (Powertrain Control Module) detects that the catalytic converter on Bank 1 is operating below a minimum allowable efficiency threshold. Note that “Bank 1” refers to the exhaust system on the bank of cylinders that contains cylinder #1. So why does code P0420 affect Toyota applications more than others? Although this code can potentially affect all applications, the fact is that due to their design and construction, catalytic converters on almost all Toyota are far more sensitive to faults, defects, and failures that affect the operation of catalytic converters, than the catalytic converters on other applications are. In many cases, the PCM’s programming on Toyota applications is to blame in the sense that its calibration is so sensitive that it is almost fault-intolerant, which means that the PCM will set code P0420 long before a similar set of circumstances will trigger this code on most non-Toyota applications. Note that in many, if not most instances of code P0420 on Toyota applications, the problem can be resolved by reprogramming the PCM with updated software. It should also be noted that Toyota is the only manufacturer that recommends a process of cleaning the affected catalytic converter in a procedure that is roughly analogous to how a DPF (Diesel Particulate Filter) is regenerated. However, this process should only be performed by the dealer or other competent repair facility, but be aware that it has a success rate of less than 50%. 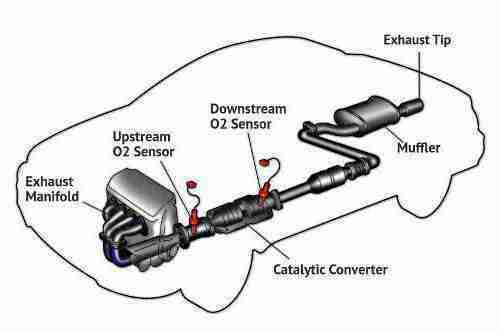 The image above shows the typical location of catalytic converters on Toyota applications, as well as the locations of both the upstream and downstream oxygen sensors. 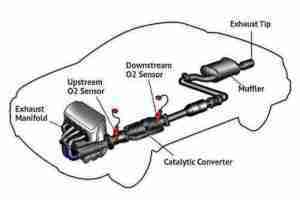 Note that although the terms “oxygen sensor”, “and air/fuel ratio sensor” are sometimes used interchangeably, Toyota applications use air/fuel ratio sensors, which are NOT interchangeable with oxygen sensors. NOTE: While premature failure of catalytic converter s on Toyota applications is a common occurrence, there are many other possible causes of code P0420 on these applications. Therefore, it is important to record all codes, as well as all available freeze frame data present, and to resolve all additional codes present in the order in which they were stored before condemning the catalytic converter out of hand.